Promo Value: Enjoy RM5 off x 2 rides. Promo Usage: Applicable for Grab new & existing users only, valid with cash or credit/debit card only, valid to/from BSG, The Galleria. Valid for GrabCar or GrabCar (6-Seater) only. Step 2: Select GrabCar or GrabCar(6-Seater) icon and tap Next. Step 3: Key in BSG, The Galleria as Pick up or Drop off points. 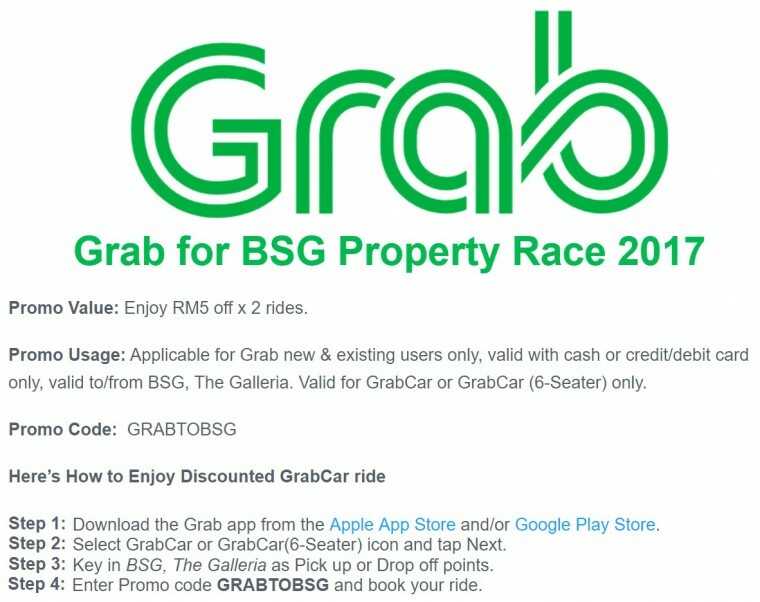 Step 4: Enter Promo code GRABTOBSG and book your ride. The Campaign will run on 7 May 2017( 4am-12pm). The Organiser reserves the sole and absolute right to alter or end the Campaign at any time prior to the expiry of the Campaign Period without giving any prior notice and no compensation in cash or in kind shall be given.